Michael Lazar (operating here under the nom de lounge Mr. Manhattan) is a freelance DVD Designer and Author working in the San Francisco Bay Area. A lifelong passion for food and wine now leads him to a deep immersion in the world of cocktails, exotic ingredients and the history of spirits. 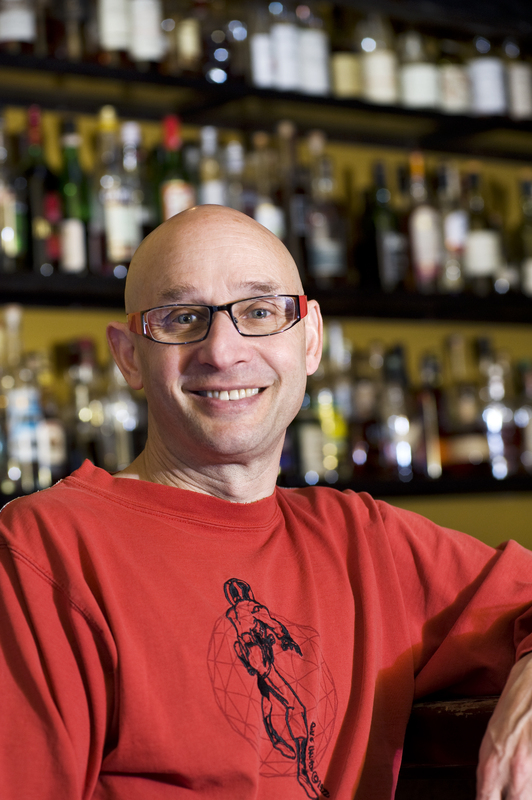 In spring of 2010 he completed BAR Smarts Advanced (as well as the on-line only Wired version) and joined the USBG. He has collaborated with Ted Munat on the new edition of Left Coast Libations. Michael’s primary responsibility was to review all the new drink recipes, re-create home made ingredients and otherwise bring consistency and sanity to the scribblings of bartenders up and down the Left Coast. With Left Coast Libations safely off to back from the printers, Michael is now focusing on publicity and sales leading up to the Fall 2010 release to the trade. He’s also starting to offer classes for home mixologists interested in honing their skills and learning more about cocktail and spirits history. If you live in the SF Bay area and are interested, please drop me a line. He’s also looking for work behind the mahogany. If you’re in need of a craft bartender (or an eager to advance bar back), look me up. Last night I had a wonderful cocktail in Tucson at Jaxs restaurant. I ordered a raspberry gimlet and it was served in a lowball glass with ice. The drink was mixed Effen raspberry (vodka), lime juice, and simple syrup and appeared to have some raspberries (frozen?) muddled in the bottom of the glass. My question, dear sir, is how does a proper gimlet usually get served? I preferred to have it shaken and then poured into a martini style glass. The ice in the glass made it a bit messy to drink! In my mind, a Gimlet is always made with gin and not vodka and fresh lime. However, the noted cocktail writer Gary Reagan says that Rose’s Lime Cordial (often used in gimlets) is such an old ingredient, it probably existed before this cocktail was first created. I’d hazard a guess it’s probably made very differently now then it was in pre-prohibition days. they are doing to the gimlet what they did to the martini… everything-tinis & now everything-gimlets. the original gimlet was gin and Rose’s lime cordial (called “sweetened lime juice” in the US). since the current formula in the US is made w/ high fructose corn syrup, i will never have an original, authentic gimlet ever… except maybe in the UK where the original formula is still sold. Alex ~ Hello, BTW. I didn’t realize it was you dropping in for a visit. I have been hooked, TYVM, on Orientals. At home I did not have all the exact makings so I improvised using bourbon instead of Rye, always on hand here, French Sweet vermouth, not sherry, of course the Triple Sec and lime plus I added 1 ounce freshly squeezed OJ and yummy!!!! I feel so grownup having a cocktail at home. The Oriental does provide a nice template for creating other cocktails. However there is but one Oriental and it’s made with rye and no OJ. Hello there Mr. Manhattan! Your insanely delicious-sounding Calamondin marmalade pisco sour just caught my eye (and major kudos for growing them in your backyard — not something we can do in NYC!) Anyway, thought I’d send you a sample of the pisco my sister produces. If you drop me a line with your address, I would love to share a bottle of our single-grape Quebranta and hear your feedback, not to mention how it plays with your recipe. Lizzie: Tried sending you an email but I received a message saying your account was ‘locked’ and not accepting message. Can you email me directly? My address is laz [at] okeanos [dot] com. I hope you had a great time in PDX this past weekend. Hey mr. Manhattan ( or should that be Mr. Manhattan Beach Brooklyn). I think we grew up together and were friends throughout school. Wasn’t it you that introduced me Shun Lee Dynasty. ? I’m making bitters and have had trouble getting cinchona bark. My herbalist says he can’t get it anymore because of government regulation. Online I’ve only found powdered varieties by the pound. Do you have a suggestion for a replacement or a place to buy? Thanks very much! Your blog is so informative!! Hey Mr. Manhattan — do you do in-home (in-garden) consultations? I live across the Bay from you in San Carlos. I grow a lot of citrus. The fun stuff (when the gophers don’t destroy it) — yuzu, chinotto, Buddha hand, various quats, etc., and a plentiful herb garden. I did do your Rock’n’Rye with the chinotto — it was a stunner. I’m looking for more ways to get loaded off the garden. If you’ve got more ideas on how to put this bounty to use, I pay very well in terms of high end charcuterie and such things. Happy to hash this out any time. Or just a phone call or email would be great.